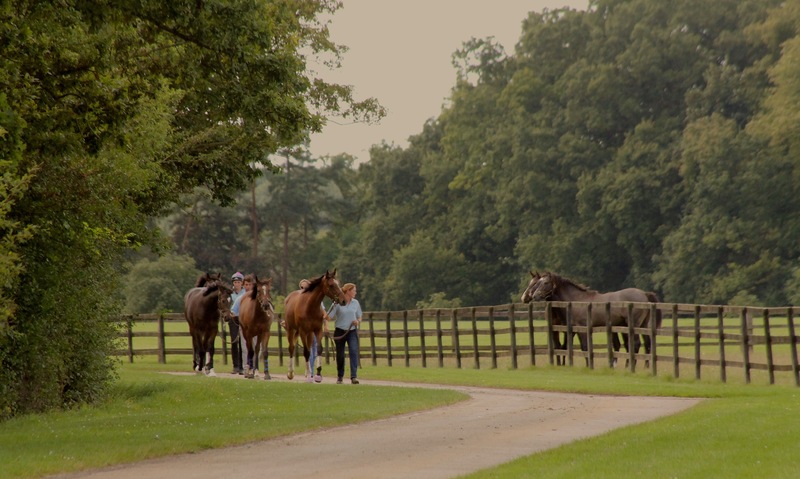 Fittocks Stud has a curious name – it was inherited when the original Stud was purchased in Cheveley in 1978. No one knows the meaning of the name but it has stuck! The current Fittocks Stud in Upend consists of 360 acres. The first parcel of land of 100 acres was bought in 1984 and subsequently 200 acres were added in 1994. A further 60 acres were purchased in 2010. The majority of the land was arable and had to be drained, seeded, fenced and planted with trees to achieve what you see today. The small stock that came with the original purchase included FREE GUEST, who won the Group 1 Nassau Stakes and the Group 1 Sun Chariot Stakes twice, and became the dam of SHAMSHIR who won the Group 1 Fillies Mile at Ascot in 1990. Further success came with the purchase of KALATA who was a sister to the dam of our Epsom Derby winner KAHYASI. She became the dam of KITHANGA who won the Group 3 St Simon and finished second in the Group 1 Irish St Leger. She was the dam of our first major sales success MILAN who was sold for 650,000 gns and went on to win the Group 1 St Leger and finish second in the Group 1 Breeders Cup. Special mention must also be made of SOUK who was purchased as a yearling and started a dynasty that included ALEXANDROVA winner of the Group 1 Irish Oaks, MAGICAL ROMANCE winner of the Group 1 Cheveley Park, CHICQUITA who also won the Group 1 Irish Oaks and was champion three year old filly in Ireland and PONGEE who won the Group 2 Lancashire Oaks and finished second in the Group 1 Yorkshire Oaks. FANTASIA who was the second highest rated two year old filly of the year and went on to win the Group 3 Nell Gwyn, the Group 3 Prestige Stakes and finished second in America in the Group 1 Just A Game Stakes. FORTE DEI MARMI after a successful career in the UK he went on to win the Group 1 Northern Dancer Turf Stakes and the Group 2 Sky Classic Stakes twice in Canada. SILK SARI, our flag bearer in 2015, won the Group 2 Park Hill Stakes and was second in the Group 1 Fillies and Mares Champion Stakes. She has now produced a Dubawi filly and is due to visit Frankel this year. CHARMING THOUGHT, winner of the 2015 Group 1 Middle Park Stakes, was also raised and grazed at Fittocks Stud for owner Craig Bennett.